I have many times told stories on my grandmothers, have I not? What about my grandfathers? Sadly I do not have much time with them as they both passed on when I was less than 5 years old. But anyhow, when it comes to food, especially in our Asian culture, it is almost mostly about our grandmothers. It would be them toiling away in the kitchen day in day out just to feed the family and as well as their dear husbands. It had been a long time since I last join a food event, but this time it got me out of my cold storage box again, just because the theme really got me at my heart. This event is about, quoting african vanielje, celebrations of mothers and grandmothers and time spent with them in the kitchen, in dedication to Jeni’s mother. Apples and Thymes, it seems like the perfect name for the theme today, though I cannot explain why. If you are a regular reader of my blog, you would have read bout my stories about my Ah Ma (grandmother) in so many occasions. For Ah Ma, the ever diligent wife, mother and grandmother, the always seeking of self improvement, the only bind now to our big family tree, the reason we all should appreciate and celebrate life and the ties to our roots back to China itself. I bet these reasons are truly strong enough for a celebration, a big one at date. So let’s toast to my Ah Ma and all the mothers and grandmothers in the world. You all somehow make this world a better place. Looking back, it seems that I did not spend enough time with my Ah ma in my earlier days. What a shame, I certainly could have learned a lot. It was not until I went to Kuala Lumpur, the capital of Malaysia, to study and now to work, that I learn what I have all these while been taking for granted – real food laboured with real love. Maybe it is also our Asian way of life, where kids are not allowed to play in the kitchen; too dangerous, too troublesome, going to cut self with knife, breakables would be broken, edibles made inedible and the list would go on. That is how then, this little Chinese kid got left out of her Ah Ma’s kitchen, much to her lament. But I remember the festivals, the time where we (kids) just might have the reason, or rather the chance to help out in the kitchen. I remember once, during Tanglung (Lantern) festival, I don’t know why this event was etched firmly in my memory where I can picture it vividly in my mind, where my sister and I walked into the kitchen where there were hundreds of mini Tong Yuens (glutinuous rice dumplings balls) in plethora of pinks, whites, greens and yellows in a huge metal tray. Ah Ma’s version of Tong Yuen is more of the north Malaysia style, small and plain with no fillings. My sister and I would eagerly help to shape the balls. I still remember Ah Ma saying, “Aiya, not like that, one big one small. Aiya, not round enough, let me show you”. She then will show her spectacular skill of rolling Tong Yuen into a round ball at the right size at amazing speed, due to years of making of thousands of them. Although she would try her best to advise us, we end up with Tong Yuens of various sizes and some oval, some round, some flat. In the end, she would still smile, praise us for our help and then throw it all in boil and then add into the prepared sweet ginger soup. I found a video here at Malaysia Best, where there are two little boys helping out with making Tong Yuen. Anyhow, after I went to the big world out there, I do also always try to return to my little hometown, where every time I would bombard my Ah Ma with various questions on how she make this or that dish. Just like every cook, especially the ones who enjoy it, she would go into a long and detail description from picking of the right vegetables to the right cut of meat, then to right preparations and the many seasonings up to the right way of cooking and down to the right time itself. I would sit there fixated, nodding occasionally and try to absorb everything. Sometimes when the list got too long, I might whip out my PDA or a paper to note things down. When I got home again, I would try to replicate some of dishes that I learned, mostly a success as Chinese cooking when once you understand its basics and have spent years in eating them, you can easily make it, but mostly it is never up to par to Ah Ma. Maybe in the future, after years of practice, I might make it as good as her. Although there were many of her dishes that I loved, there was one dish that I hold really dearly to my heart personally. 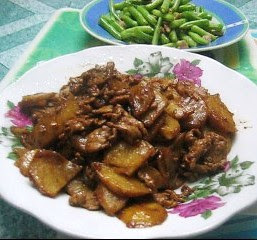 This one dish that I always beg her to make is ho lan shu chu yok (stir fry potato and pork in dark soy sauce). Whenever she cooks this dish is I would be eating and eating it way after I finish off my rice. I would have to pry myself from the table in risk of finishing it before anyone else can have the chance to eat it. Then, after a while off, I would then pester her again, “Ah Ma, when are you going to cook potato chu yok (this mixed term was coined since I was really young) again?”. She would then just smile and ask if I am ever bored at it, which I would shook my head vigorously. Even after long gone from home and back again, I once again request for this comfort dish of mine. I am so excited when we finally cook it together in her kitchen; after all I am not a kid anymore right, where I would be more of a help than a nuisance, then again, arming with camera in hand, I do seem worst off, but a food blogger got to do, what she got to do – shoot!